After 49 gruelling days in court, Oscar Pistorius today learned of his fate. Pistorius was sentenced to 5 years in prison for the manslaughter of his girlfriend Reeva Steenkamp. The former track and field star was also handed a suspended 3 year sentence for a firearms offence by Judge Masipa. Upon conclusion of proceedings this morning, Pistorius was led down the 23 stairs of the Pretoria High Court to the holding cells below to await immediate transfer to prison, possibly Kgosi Mampuru II prison. Uncle Arnold Pistorius said "We accept the judgment. Oscar will embrace this opportunity to pay back to society." However, Pistorius’ lawyer Barry Roux expects that his client will only have to serve 10 months of the sentence in prison before seeing out the remainder of the 5 year term under house arrest. This is despite the prosecuting authority indicating that Pistorius will serve at least 1/3 of the sentence. A lawyer representing the Steenkamp family said that they believed that justice had been served. Reeva's mother June answered a question upon leaving court where she said that while the verdict brought some closure it could never offer full closure without Reeva "unless you can magic her back". Pistorius grabbed a gun in his apartment on Valentines Day of 2013 in response to what he claimed was an intruder. 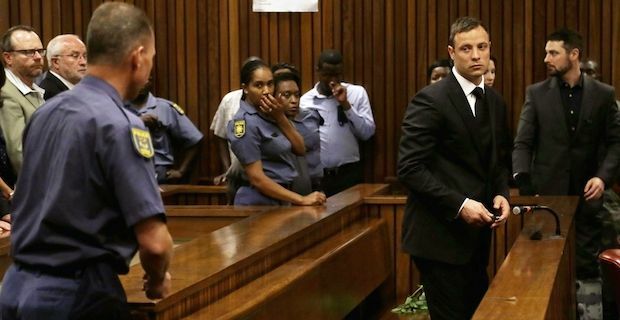 He admitted to firing 4 shots through a closed bathroom door where his girlfriend Reeva Steenkamp was and as a result she died almost immediately from the deadly wounds. Pistorius was eventually cleared of her murder but was found guilty of manslaughter last month.